Our collaboration with uber-talented artist Jess Johnson has been featured in the Australian Financial Review! One of our favourite stylists, Frances Mocnik, arranged a clever motif combining science, the senses, and of course our silk scarf. Get yours here before they sell out once again! Can you imagine if the world was black and white? No, neither can we! Colour has the ability to tap into our emotions both evocatively and intuitively. Phrases like: ‘feeling blue’, ‘seeing red’ and ‘tickled pink’ all arouse a sense that would be lost without their hue. Artist Katie Eraser understands what colour can conjure, and it is both literally and figuratively at the heart of her work. Eraser’s abstracted, curved shapes and bending planes of colour demonstrate why scarf label, One of Twelve wanted to collaborate with her. With titles such as ‘Hahaha. Seriously!’ and ‘Oh huni, it was so good to chat’, the scarves evoke relatable everyday experiences with just a hint of tongue-in-cheek. Wonderfully warm and inviting, these pure silk twill wares explore the rapport between us and the image, creating a colourful cocoon that can be worn around the neck, shoulders and as a turban of course! Colour captures. Colour invites. Colour stimulates. Colour is a celebration of humanity in all its imperfect splendour. Let’s take a trip down the garden path, where green manicured hands pluck wild strawberries and nocturnal snails orbit the moon. Fairy-like and feminine Walmsley & Cole’s scarves allow us to indulge our inner dreamer. To be youthful. To be full of froth. The ‘Green Fingers’ twilly is the perfect accoutrement for our imaginary picnic. Awash with the palest of pinks and lilac, its plucking green hands and ruby red berries add a hint of the surreal. Our garden feast calls for gingham. Look no further than this fairyfloss pink, frilled dress from The Vampire’s Wife. It complements the pastel hues of the scarf perfectly. But what other treasures have we got hiding under the bushes here? Shop the Walmsley & Cole Green Fingers silk twilly here. The silk show has begun! Excuse our little ditty but it’s the first thing that comes to mind when ogling New Zealand based label, Walmsley & Cole’s charming silken wares! Reading like storybooks, their squares and twillies are decorated with blue-stockinged crossed legs; moon travelling snails; and freshly manicured green hands plucking sweet wild strawberries. Surreal worlds of escape, these scarves are designed, or should we say conjured, by husband and wife team, Faith Walmsley and Nick Cole. With a rich background in graphic and textile design, Faith yields her paintbrush like a wand, creating whimsical motifs that delight and beguile. Using our custom printing service, we acted as Sorcerer’s apprentice to help transform them into scarves. Awash with pastel tones and quirky patterns, Walmsley & Cole’s first chapter marks a dazzling debut and has us yearning for the next adventure. Shop the first drop of their new range here. Whiteley. The name says it all. In a mere two syllables an anthology of Australian artistic icons was born. Brett Whiteley is undoubtedly one of our most celebrated and revered artists. His impact on our culture is profound and continues to resonate long after his death. The NGV’s latest exhibition, ‘Baldessin/Whiteley: Parallel Visions’, draws comparisons with fellow Australian artist, George Baldessin. The exhibit explores the artists’ work in the context of what it is to be human in an urban environment at a time of tension, while also celebrating the human spirit. To hallmark the exhibition we custom printed Whiteley’s 1975 work, ‘Evening coming in on Sydney Harbour’, onto diaphanous silk chiffon with hand-rolled hems. Sydney harbour’s inky waters ripple and swell upon its generous size, with glimpses of the Harbour Bridge appearing every now and then in Whiteley’s characteristic brushstrokes. Like his art, this scarf has longevity. For more info on Skarfe’s custom printing services email info@skarfe.com or if you’d like a Whiteley scarf of your own, contact the NGV Store. Brett Whiteley silk chiffon scarf by SKARFE for the NGV. After a recent trip to Sydney Contemporary Art Fair it is plain to see botanical prints are having a moment. We saw birds with decapitated heads highlighted in fluro by artist Joan Ross, native flowers printed and layered on glass displaying the colour spectrum, and Damian Hirst’s famous foil printed butterflies. Call it collective consciousness, but with all these botanical references in bloom, the timing is rather apt for the Museum of Australia to release their Scott Sisters scarf, designed and printed exclusively by us. Who are the Scott Sisters? Helena and Harriet were two of 19th Century Australia’s first professional female natural history illustrators. Born to Harriet Calcott and wealthy entomologist, grazier and entrepreneur, Alexander Walter Scott, they mixed in a liberal-minded community who encouraged women in their ideas. Schooled by their father in the techniques of natural history illustration and scientific observing and collecting, they helped compile his book Australian Lepidoptera and their Transformations. While only 21 of the 100 paintings were published, it is plain to see the sisters’ talent to capture the minute intricacies of nature through their use of colour, texture and detail. When we were presented with the sisters botanical plates and asked to turn them into a scarf, we jumped at the chance. 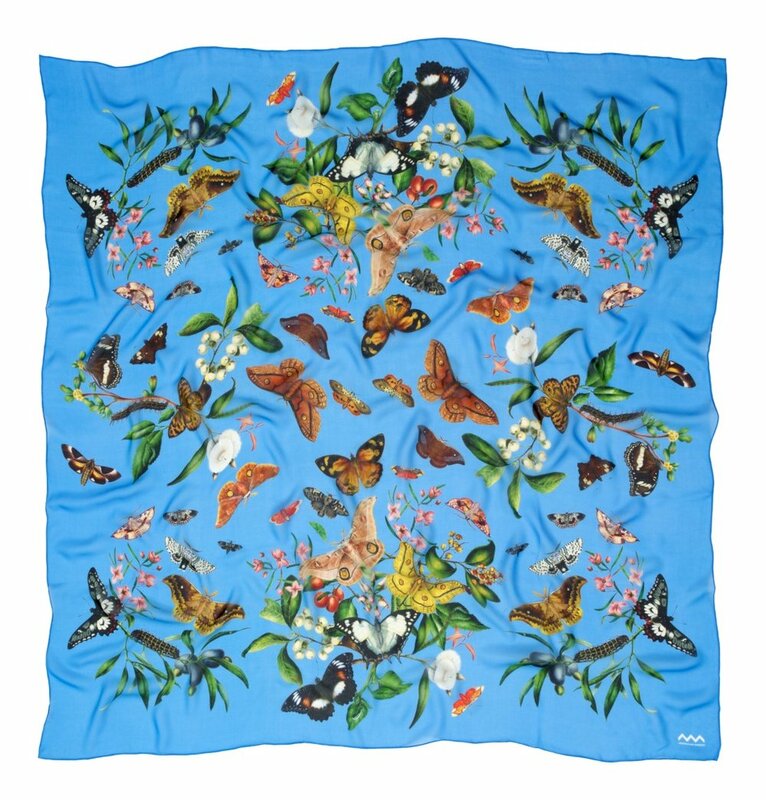 The vivid colours and patterns of the butterflies wings and native flowers come alive on a swathe of chiffon, while the black and blue backgrounds make them seem like they are taking flight. Paying tribute to the Scott Sisters skills as artists and scientific observers has been a true honor and we hope they would approve of our interpretation. Are you sick of the monotony of winter yet? Snap out of it! 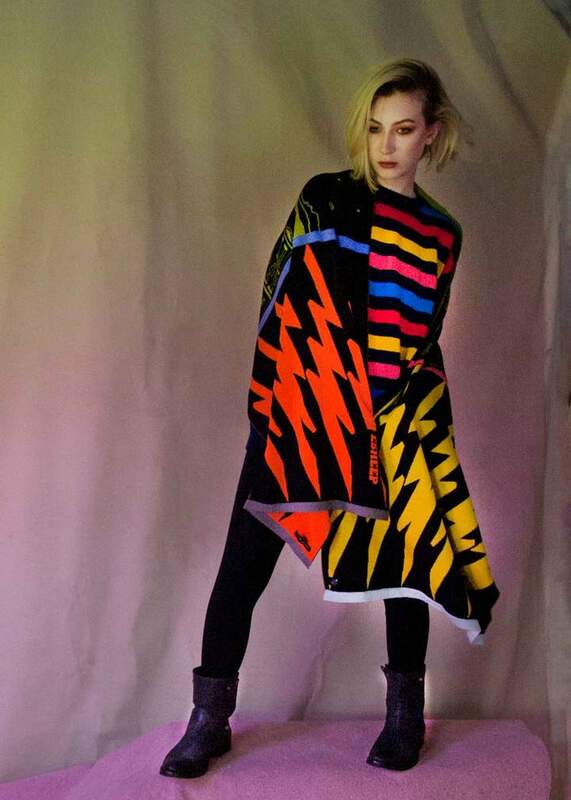 It’s time to hook yourself up to some electrodes and give your wardrobe a ZING, ZAP, KAPOW with Electronic Sheep’s ‘Universal Cowboy’ Scarf. Buzzing with shades of pink, yellow and purple, this winter wooly triangle wrap is going to see you through the last of this arduous month and light years beyond. But what to wear with it? A stand-alone piece, it merely needs ‘supportive’ players, but players with major A-game! Merging Western elements with a little ‘80s nostalgia, we have layered the scarf over Goen.J’s faux-leather shirt-come-wrap dress. The drapery detail balances the handle of the scarf perfectly. Off-White’s cowboy boots are made, well, read for yourself- ‘For Walking’! They nod to Electronic Sheep’s western inspiration but also channel fashion’s new found love of text, be it a slogan or logo. Prada’s neon backpack (a long awaited revival), Mykita’s zingy green frames and Roxanne Assoulin’s crystal bracelets make the outfit spark and highlight the punchy hues in the scarf. Keep the look modern and edgy with Oscar de la Renta's spikes earrings. GAME OVER! This outfit pulses with electricity and will have you sheriffing the streets like a modern space cowboy! Yee-haw! Gender-neutral cowboys, space, saloon barmaids — Electronic Sheep is knitwear not as you know it. Founded by childhood friends, Brenda Aherne and Helen Delany, this Irish label is defined by its detailed tapestry-esque jacquards and imagery that evoke a sense of nostalgia that is both retro and contemporary. Electronic Sheep’s latest collection ‘Universal Cowboy’ brings to mind being a teenager in the 80s, with its acid hued graphics like icons of a classic arcade game. The duo have often cited the influence of growing up in suburban Dublin during the 80s. Their aesthetic draws from the myriad of cultural movements at the time like mod, punk, ska, metal, new wave and the new romantics. Their designs echo the radical nature of the era but are very much of today. Commissioned by the ‘Crafts Council of Ireland’ in aid of local knitwear makers, ‘Universal Cowboy’ reads like a great Western, with motifs inspired by Arizonian landscapes, cowboy boots bought in Vegas and Mexican cigarette packets. Crafted by specialist makers in Greece with 100% merino wool, each scarf generously sized, some almost blanket-like, and is made to see you through a chilly Winter. We're so excited to include Electronic Sheep at Skarfe, as they're unlike anything we have seen before - much like a cowboy in space! Jothomasina’s cashmere modal scarves dictate fashion. More than mere print, these scarves read like the pages of Vogue with illustrated looks direct from the runway. A mixture of primrose pink, lilac, powder blue and grey, the ‘Pastel Runway Scarf’ offers a myriad of outfit opportunities. Keeping with the notion of ‘fashion forward’ we have teamed this scarf with Prada’s outrageous feather trimmed jeans. For a few seasons now jeans have been infiltrating the ‘dressed-up’ sector — marking their territory in the office, restaurants and even cocktail parties. To pull them off though you need the perfect top — something glamorous, daring and voluminous. We love Rosie Assoulin’s pink blouse* patterned with cameos. It’s V-neckline acts like a frame for Jothomasina's scarf and brings out the pastel tones. Keep your shoes fun but not too over-baring, like Rochas’s floral bow beauties, remember you want those feathers to fly! Olympia Le Tan’s cult embroidered book clutches are the ultimate fashion favours, while Serge Kirchhofer’s rose-coloured glasses keep things feeling rosy. *Now sold out. Find similar here or try this bow-embellished cardigan for a more casual feel. Immerse yourself in the wonder of the natural world with Arlette Ess’s ‘Koi’ scarves. Based on the artist’s original Indian ink painting, they feature the feng shui number of nine koi, swimming closely together in a swirl of colour and movement. The vivid colours are true representatives of the koi breeds; Sanke, Kigoi, Asagi, Tancho, Kumonryu, Matsuba, Utsuri, Goromo and Soragoi. With a mythological undertone, Ess explores the duality in the ‘attracting prosperity’ of these prized fish. Far beyond their symbolic notes, Ess’s works are beautiful wearable objects. Available in silk twill, silk chiffon and wool, these are scarves that transcend seasons, swimming around your neck in an organic display of shapes and patterns. Ess’s art reads like a love letter to nature. Her intricate renderings communicate so much more than mere representation. They exude a sense of fragility, an ephemeral beauty that stems from the artist’s deep connectivity to the world. It is this essence that makes us so proud to include her scarves into our repertoire. Shop the Arlette Ess selection here. Illustration is at the heart of fashion. Without the fluid line of a designer’s hand how else would their vision be realised? For centuries style and trends were communicated through the painted page. It wasn’t until 1932 when Vogue put its first colour photograph by Edward Steichenon the cover, fashion illustration was declared ‘dead’. But oh, how wrong they were. Paradoxically, while technology may have ‘killed’ such an art form, it has also helped revive it. Thanks to Instagram the art lives on— and oh boy, are illustrators making the most of it! Fashion illustrations are no longer mere pieces of art —they are iPhone covers, cushions, and now scarves. We are delighted to introduce Cape-Town based designer and illustrator, Jo Thomas, of label JOTHOMASINA. Through Thomas’s paintbrush, the catwalks of Milan, Paris, New York and London come alive on pure silk and modal cashmere. Rendered in a mixture of jewel tones and pastels, the models blur into what could only be described as a camouflage print when draped around the neck. We think fans of Skarfe in particular, will be overawed by the ‘How To Wear’ silk scarf— a visual instruction manual of how to wear, well, scarves. Fashion illustration lives. It lives far beyond the painted page, it now has a place in our wardrobes too. Fashion really has come full circle. Shop the first drop of our JOTHOMASINA scarves here. Australian Indigenous artists are creating some incredible artworks. Combining tradition with modern principles, we are now seeing dot paintings rendered in vibrant hues such as fuchsia, electric blue and sunflower yellow. Scarf label, One of Twelve understands the power of these works and their place in modern culture. Collaborating with Aboriginal and Torres Strait Island artists, such as Samuel Miller, these scarves make a fashion statement. Miller’s ‘Ngayuku Ngura’ silk satin scarf is alive with colours and would breathe new life into any look. However, we’ve decided to give this piece an American Hustle makeover by teaming it with Sies Marjan’s creased metallic trench coat and Jimmy Choo’s white sock boot (side bar: white boots are going to be a big trend this winter, just remember not to wear them on rainy days!). Schield’s leggy earrings hit the right notes with their contemporary design, while The Volon’s sequin embellished bag picks up the rainbow of colours in Miller’s scarf. At first sight this is an outfit built on the classics: a trench coat, ankle boots, Jackie O sunglasses and a neat box bag (a shape worthy of The Queen), yet like Miller’s scarf, each piece challenges convention and proves that tradition can live outside the box. There can be no denying the magic of colour. We each experience it in a completely different way, its spectral hues making an impression. The Art Gallery of South Australia charts the revolution of colour through the art of the Impressionists with their new exhibition, Colours of Impressionism. With 65 masterpieces exclusively on display from the Musée d’Orsay, one can revel in Monet’s emerald greens, Renoir’s blush pinks and Manet’s dramatic tones. As part of the exhibition’s gallery shop we have rendered our own cashmere scarves in hues reflective of The Masters palette. From forest green and cornflower blue to rosy pink and lavender, our scarves move like the brushstrokes of Pissaro. We also collaborated with the Gallery to turn Paul Signac’s Les Andelys (1886) painting into a silk chiffon scarf for the exhibition. Back in 1886 when the painting was first exhibited, critic Gustave Kahn noted that the piece was ‘deeply infused with the joy of things and illustrated with the magical effects of light.’ (La Vie moderne, 9 April 1887). The same can be said of its transformation into a scarf. We chose to render the work onto silk chiffon to enhance the iridescent quality of the work, as the water seems to ripple with movement and the greenery rustles as the wind blows through. The dappled brushstrokes and muted palette of green, greyish blue and biscuit neutrals meld into a luminous pattern when draped around the neck, drawing focus to the colours themselves. This is a stunning exhibition that cannot be missed, especially when you can take home a piece from the Musée d’Orsay— in scarf form of course! Colours of Impresssionism runs from March 29 to July 29 2018. Purchase your tickets here. There is nothing more beautiful than a rose. From its initial stages as a teardrop bud to the unfurling of its velvety petals — it is beauty in its purest form. Melbourne photographer, Fabrice Bigot, has captured the rose’s ephemeral majesty in his latest exhibition ‘BLOOM’ at MARS gallery. Held in honor of International Women’s Day, the exhibit reads as an ode to women, with each rose acting as a symbol of individuality and haunting beauty. Bigot transports the viewer to the early morning hours in various Victorian gardens, drawing the flower into focus with his play on light and heightened colour. One can almost taste the fresh morning dew, touch the rose’s silky petals and smell its sweet scent. Bigot’s work allows us to experience a moment in time that is both familiar and meditative, and therein lies the artist’s power. As part of the exhibition we transformed Bigot’s work ‘Flores Venerae #7’ into a pure silk chiffon scarf. Limited to just 50 pieces, a percentage from the sale of the scarves will be donated to Global Fund for Women to support anti-violence programs around the world. Available at both MARS Gallery and The Store, this is a scarf that celebrates the beauty of being a woman— thorns and all. Calling all you fashion animals out there, heed the tiger's roar this outfit is for you! Centred around Amanda Testa's ‘Two Tigers’silk scarf (tied preferably at the neck or as a turban), this look will have you, ironically, standing out in Mango's oversized camo-print parka* juxtaposed with black sequin shorts and Balenciaga's iconic embellished heels. Mercedes Salazar's palm leaf earrings emphasise Testa's exotic jungle vibe, while A-Morir's quirky shades and Roxanne Assoulin's 90s-inspired bracelets keep things upbeat. Honour the big cat family with this leopard print bag — perfect for stowing away all those essentials you need to explore the urban jungle. *Note the little frog brooch- a souvenir from your explorations perhaps? It’s time to kick up your heels and do a highland jig, Phillip Ayers has given classic plaid a modern make-over! The master of abstraction, his re-imagining of the iconic print takes on a pixelated form, rendered in an array of bold contrasting colours. Spun from a mix of wool and silk, their generous size offers a myriad of styling options, from an easy enveloping of the shoulders to more complex wrapping styles sealed with a brooch - why they’d even make a great blanket! While seemingly familiar with their Scottish undertones, these wraps are thoroughly modern and will play an active role in your wardrobe come winter. There can be no denying that Australia is the home of some of the worlds greatest treasures, but why, oh, why does it have to be so far away from everywhere else?! Unlike those lucky ones in the Northern Hemisphere, the mere exercise of jumping on a plane to visit a foreign land for a day or two, is not only exhausting but can be rather taxing on the bank account. But oh how we long to see more. While some of us armchair travellers may get our travel fix from Instagram or flicking through the pages of Gourmet Traveller, it is scarf label Bird & Knoll who satiates our wanderlust. Each season they invite us to escape to far off lands, with their luxurious cashmere blend scarves acting like windows to different destinations around the world. This season they have provided us with a one-way ticket to Greece, Italy and Morocco. The images are so vivid, so enticing one can almost touch the trinkets hanging in a market stall in Athens; count the tiles paving the lofty heights of the Piazza del Duomo in Florence; and smell the North African flavours of a spice alley in a Moroccan souk. Like fabricated postcards, each scarf swirls into a blend of colours and patterns, capturing not only the essence and escapism of travel, but the visual make-up of what the world has to offer. Envelope yourself in the journey - no passport required! There is no doubt about it, Australian organisation, One of Twelve, is our kindred spirit! Passionate and dedicated to the art sector, they have created a range of scarves that celebrate emerging and established artists within the Asia Pacific region in a tangible way. As many of you are aware, art is at the heart of everything we do here at Skarfe — it is in every silk fibre that hangs in our store— so it seems only natural that we should welcome One of Twelve into our collection. Working directly with Aboriginal and Torres Strait Islander art centres, the range includes works by five artists: Margaret Baragurra, Derek O’Conner, Ham Darroch, Jimmy Donegan and Samuel Miller. Each vibrant design is realized on a silk satin square with hand-rolled hems and is accompanied with the artist’s card, detailing their background and practice. While each scarf is utterly unique, there is an intrinsic harmony that is so undeniably Australian. It is this focus, this interest in our country that makes these works so empowering. We are so excited to have found our soul sister, or brother from another mother, in One of Twelve and hope you too will be captivated by their cultural synergy. Our Karen Black collaboration scarf kept good company last weekend in Sydney Morning Herald's Good Weekend Magazine. Sitting pretty alongside colourful objet d'art by Pipilotti Rist, Del Kathryn Barton and Louise Bourgeois. Shop Karen Black for Skarfe here!